A man, who recently returned from the United States (US), was Wednesday charged with the murder of Richard Ishmael Secondary School teacher, Kescia Branche. Matthew Munroe was not required to plea to the indictable charge when he appeared before Chief Magistrate, Ann Mc Lennan. He was remanded until January 9, 2018. By that time, the Director of Public Prosecutions chambers is expected to complete outstanding work, according to Police Prosecutor, Inspector Gordon Mansfield. He was represented by Attorney-at-Law, George Thomas who said his client was repeatedly beaten and gave him a statement to sign. However, Munroe refused to do so. 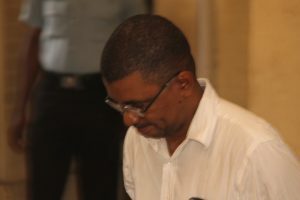 Thomas also told the court that at the time of the incident Munroe was at no time physically present in Georgetown but he was communicating with Branche by phone. He arrived shackled and handcuffed at the Georgetown Magistrates courthouse at 2:32 pm. Inside the courtroom, the bespectacled father of six minors was very calm and composed. A badly battered 22-year old Branche was found in an unconscious condition lying on the road in the vicinity of Princess Street and Louisa Row. She died on November 7, 2017, three days later in hospital. Munroe’s car was impounded by police after evidence had surfaced shortly after the incident that they had been in telephone contact hours earlier. The 47-year old Munroe of 16th Avenue, Diamond Housing Scheme, East Bank Demerara said he had travelled to the US for a family engagement with his niece. Munroe was arrested immediately on arrival at the Cheddi Jagan International Airport. His wife, who is Georgetown’s Deputy Town Clerk, Sharon Harry-Munroe, was present in the courtroom. Two policemen, in whose company Branche had been hours before she was found on the roadway, have not been charged.